The Polytron IR is an explosion proof gas detector for continuous monitoring of combustible gases and vapors in ambient air. The transmitter is built for the harsh offshore environment (SS 316 enclosure) and uses state-of-the-art microprocessor technology to convert the signal from a infrared DraegerSensor® to a 4 to 20 mA analog or a HART® or RS485 digital signal output. The unit is designed for one-man calibration, and offers a variety of diagnostics and self test features. The configuration and calibration of the transmitter is menu guided and easy to perform, using a HART hand held terminal. UL, CENELEC, CSA approved to be installed in classified (hazardous) areas: Class I, Div 1, Groups B, C, D and EEx d [ia] IIC T4. 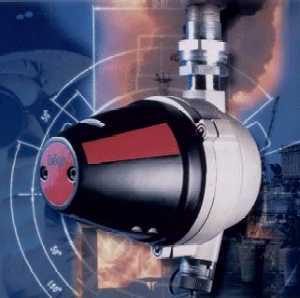 Draeger Gas Detection Systems, 10450 Stancliff, Suite 220, Houston, TX 77099. Tel: 281-498-1082; Fax: 281-498-5190.